This is the first of three reviews for Michael of Sat In Your Lap‘s Fondathon which will take place 1-3 February. 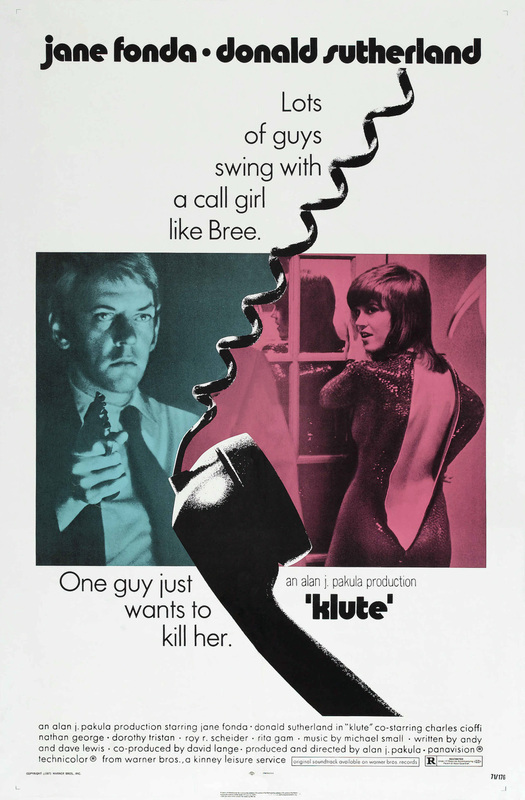 Brief Synopsis – A private detective is sent to find a missing executive who was last seen with a high priced call-girl in New York. My Take on it – This is a film that I heard about years ago, but never had much of an interest in seeing yet this blogathon gave me the right opportunity to do so. Jane Fonda gives an amazing performance in the lead role here and her character is quite layered which helps show how complex and confusing a life she leads. We get to see her with “clients” but also with her therapist which gives so much more depth to the character and in what she is thinking about her own life. Her character arc is great and the way that she transforms over the course of the film works quite well. Fonda won an Oscar for Best Actress for this performance. The plot of the film is set against a crime thriller premise yet that part is quite weak because it doesn’t give us enough thrills along the way despite a few very good surprises. Donald Sutherland is also great in this film in the title role as a detective who gets too involved in the case yet still tries to constantly keep his professional integrity as intact as possible as things move along. Part of his personality is interestingly concealed as there are a few very ambiguous scenes that help the viewer ponder what kind of man he truly is. Bottom Line – Fonda is superb in this film. She is able to show such a layered character who changes during the course of the film. She deservingly won an Oscar for her role here which is quiet complex. The plot itself moves along like a regular thriller and manages to throw out a few surprises along the way, yet still doesn’t feel unique enough from that perspective. Sutherland is also great as the detective who gets too involved in the mystery yet still tries to remain with as much integrity as he can as things move along. They do a great job concealing part of his personality by leaving a few things in the film very ambiguous which allows the viewer to decide what kind of man he truly is. Recommended! Another performance by Sutherland overlooked by the Academy. Incredible. He has NEVER been nominated for an Oscar during his entire career – most notably omitted from “Ordinary People” which otherwise received nominations for Best Actress, Supporting Actress and 2 for Supporting Actor (one of them won by Tim Hutton). How he was overlooked is beyond me.